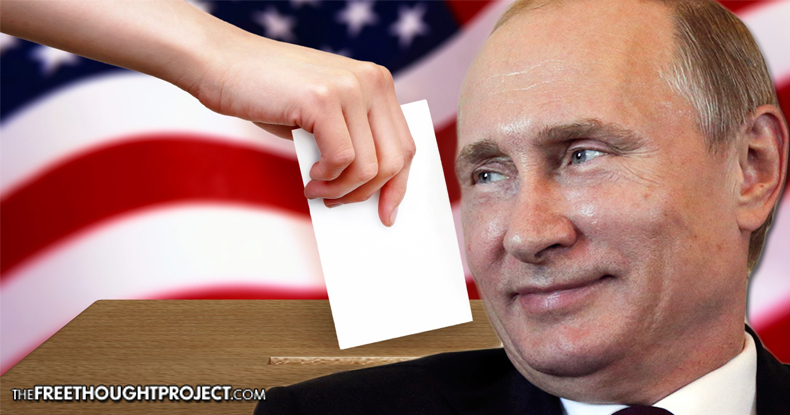 Proving he does, indeed, possess both a caustic wit and sharp political acumen, Putin just shut down the raging rigged elections controversy in what could best be called an epic prank to prove the point — Russia requested, and was unsurprisingly denied, permission to monitor the U.S. presidential election. Think about it. This somewhat tongue-in-cheek offer, although likely made with the expectation of futility, makes several critical points on the true farcical nature of the American electoral process. But the swift rebuke from the U.S. aligns more with its unprecedented since the Cold War anti-Russia propaganda campaign — a sensationalistic and proven fictitious narrative meant to inculcate Americans into believing Russia poses an imminent threat. In fact, with the Clinton campaign thoroughly capitalizing on the laughable narrative to warn Russia might attempt to rig the elections, and Donald Trump, rightly pointing to the former secretary of state’s efforts to rig the system from within and being accused of having ties to Putin, the State Department’s rebuke seems more a hypocrisy-tinged joke. How the U.S. State Department expects anyone to ignore this blatant moral duplicity — It’s Perfectly Acceptable When We Do It, But Not For Someone We Don’t Like — was not made immediately clear. Russia would, by any measurable standard, have every reason to act as an election observer, despite being “categorically rejected” — all talk of the country’s fixture at the center of the U.S.’ own negative PR smear campaign aside — particularly as Putin, himself, has noted the undeniable evidence of fraud points to rigging. Citing RT, USA Today noted, “Russia was invited to participate in routine monitoring conducted by the Organization for Security and Cooperation in Europe, in which Russia is a member, but the level of access was unacceptable to the Russians. As Wikileaks’ continued release of Hillary Clinton campaign chair John Podesta’s cache of private files evidencing the depth and breadth of collusion undertaken to ensure Clinton would be installed in the White House, the United States seems to be in an epidemic-level state of denial. And the deflection of blame by the Clinton campaign, a number of politicians, and, of course, the State Department, to target Russia as responsible for a number of hacks — and possibly colluding with Wikileaks and founder Julian Assange — to ‘rig’ the U.S. election almost certainly wholly because myriad leaks have indeed proved rigging cannot be overemphasized. Were any other nation but Russia to offer to monitor the proceedings on November 8th, the U.S. would now have to accept the offer — or risk potential allegations of actively attempting to defraud the vote. Russian officials also offered to monitor state-level election proceedings in Texas, Oklahoma, and Louisiana — but as Russian state outlet Izvestia told USA Today, they were rebuffed in “harsh” terms. In an election year not markedly tainted by absurdity — the creators of the film Idiocracy, for example, declared this year they didn’t believe they’d see it manifest into reality quite so soon — the collusion by corporate media and DNC officials exposed by leaks of the Podesta and hacked Democratic National Committee files to ensure Hillary Clinton would win the Dem nomination might be subject to criminal investigations. Instead, FBI director James Comey seemingly inexplicably refused to recommend the State Department charge Clinton — in the face of massive evidence she should be — because, for a lack of a better way to put it, reasons. Julian Assange, a political refugee, recently had Internet access cut by the Ecuadorian Embassy he calls home — at the near certain behest of the U.S. — because, as Ecuador claimed, Wikileaks has interfered in the American elections through the aforementioned damning leaks of thousands of documents, including transcripts of paid speeches Clinton gave to Big Banks. It would appear Russia, the American empire’s latest in a string of ‘enemies number one,’ further proved the system is, in fact, rigged.